Isobel has been blessed with many gifts - - artist, designer, seamstress, quilter, cook, baker, organizer, . . . along with a generous heart and sharing nature. These gifts morph into action for the Grandmothers Gampaign in a number of different ways, one being the African vests that have become 4Gs identity badge. 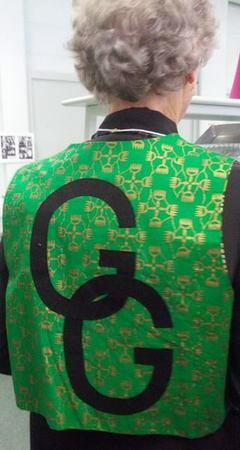 In the beginning of 4Gs, Isobel came wearing the green vest she designed, reversable no less. We all loved it. One request after another, "Would you sew one for me ?" A tradition was born. The vest quickly became our badge, a distinctive unifying identity of 4Gs. Isobel continues her search for African fabric and each month she displays an assortment. Over the years Isobel has contributed hundreds of dollars to the African Campaign through her sale of vests. Isobel brings African fabric to our monthly meetings and transfers our requests in her sewing room. - - part of Laurie's photo shoot for Loving Hands: Recipes and Reflections, the 4Gs excellent cookbook.